As in all our auctions, your 100% satisfaction is our mission in life! 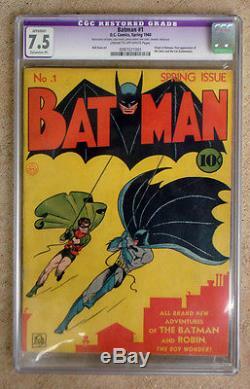 The item "BATMAN #1 1940 SPRING ISSUE CGC GRADED 7.5" is in sale since Wednesday, January 24, 2018. This item is in the category "Collectibles\Comics\Golden Age (1938-55)\Superhero". The seller is "tfes" and is located in Austin, Texas. This item can be shipped worldwide.